Short personal intro. 27, currently based in Vienna, Austria. I always had a strong penchant for everything nice and creative. I started out in interior- and furniture design, browsing books, magazines and such for inspiration. At some point i started taking pictures myself, first with a point and shoot digital camera, but when i first found my analog camera at a flea market for some 10 Euros i was instantly hooked. Turning the aperture and speed rings, manual focusing .. It had a certain kind of magic. I knew i wanted to to something related to photography, so i finished school but didn’t pursue architecture any further, i focussed on photography working for the Impossible Project and recently for Leica. Your personal story with photography. As already said, i picked up my first “real” camera some 8 years ago. I can remember it pretty well, it was a really beat up Praktica PLC 3 with a 50mm lens. I used it quite a lot for my first photographic experiments, learning how a camera worked and learning how to develop my first own films, until it fell apart and broke. Later I got myself my first rangefinder camera, a Canonet 19. The new camera was lighter, smaller and I started taking it everywhere. That was also the time I started out with street photography. I snapped pictures pretty much everywhere, be it on the way to the grocery store or just going out for a walk. After a few years of street photography, and having less time to walk the city for hours, i looked for new endeavours and found the portraiture genre more appealing, as i had more control over what happened in front of my camera. Some more time passed taking portraits, and I was asked to photograph editorials and backstage pictures at various fashion shows. From there I was asked by designers to take picture of their work, it developed and at the moment I’m trying to build a portfolio in lingerie photography. I’m always experimenting with different processes and styles, right now I’m a lot into raw and untouched photographs. I publish my pictures just as they come from the scans. Dusty, grainy and unretouched. What’s in your camera bag? Actually i don’t really carry a bag around most of the time. 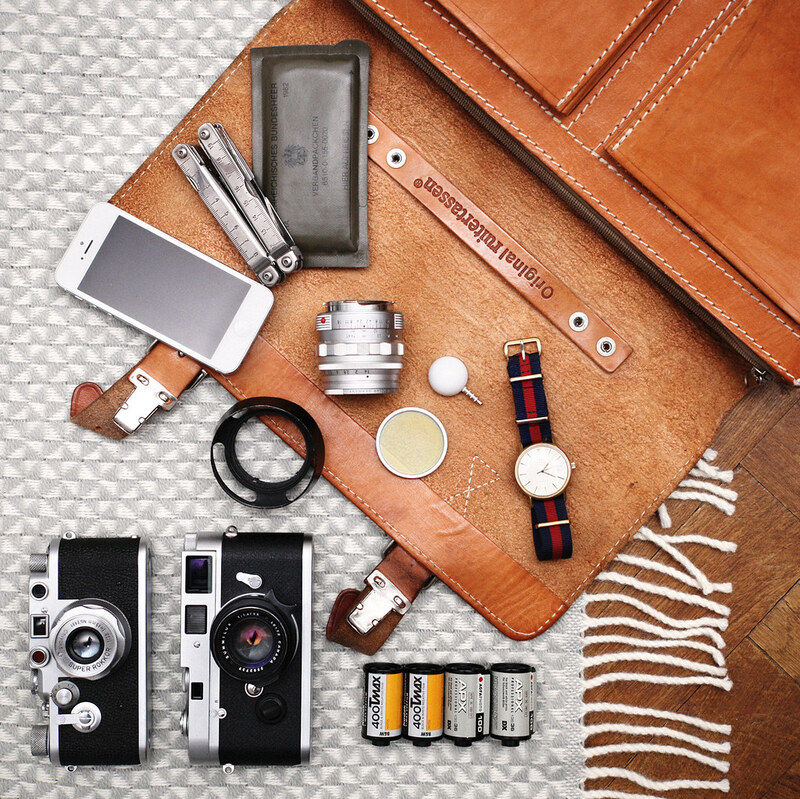 My get-around gear is a Leica MP with a Leica Summilux 35mm and some rolls of film in my jackets pockets. For snapping pictures when Im outside thats perfect, for my other works I do pack a bag. Its a vintage Ruitertassen bag, filled with my Leica MP and 35mm and 50mm Summilux lenses and a Leica IIIf with a Chinyoko Super Rokkor 45mm screw mount lens. I especially love the Rokkor for its unique signature, its a little gem of a lens. Lens hood, yellow filter and black and white film is also always in it, just like i always pack a multitool and a first aid pack, an old habit from my days in army service. Most essential part is my Lumu thou which i love to use on location for available light photography. Do you have any kind of obsession? Due to my work i have a serious case of GAS. Gear acquisition syndrome is not avoidable if you work with vintage cameras, collectors items and photography every day, so i kind of started my own little collection of cameras. Multiple rare Leica cameras and rare lenses are the fruits of that obsession and the basket is growing steadily. My other obsession is minimalism and simplicity. For me a camera is not supposed to have more than an aperture ring, shutter speed dial and a focus ring on the lens. It helps me focus on photography when in holding a camera instead of screens, buttons and menus. Where do you think the wisdom and instinct for good photograph comes from? For me, photography is about observing and making an emotional connection to the subject. When taking pictures of people, especially delicate ones, its important to have some kind of connection to the person to make it authentic, to make it feel real. I don’t know if i’m succeeding, but the feedback I’m getting at least lets me believe I’m on the right way. If you could give one final advice to fellow photographers, what would it be? Shoot what and how you want. Just do it. Shoot film, shoot digital, don’t follow trends. Try to figure out what works best for you and what you like to shoot and just go for it. Don’t forget the Sebastian’s work!